Average income in USA is on the rise, according to statistics released by the Bureau of Labor Statistics. In June 2018, average household income in America stood at $62.450. Sentier Research claims the figure reflects an increase of 0.4% over projected household income in US. Generally, the US Census Bureau keeps tabs on how much does the average American make in a year. Such research helps the government to know whether any specific segment of the population is slipping below the poverty line and those earning higher. US Census Bureau reports three different types of average American income. Average Household Income: This is the most complex calculation. Average Household Income is based upon total money earned during a year by all people living under a single roof. This calculation does not consider whether these persons are living as family, couple or individuals. Average Family Income: As this term implies, Average Family Income is calculated by the US Census Bureau on the basis of two or more person that are related and reside in the same dwelling or household. Such relations can be on the grounds of birth, marriage, consanguinity or adoption. Average Family Income is considered most important since it decides how many persons are afflicted by poverty and steps the government needs to take to alleviate their sufferings. Individual Income: Also called Per Capital Earnings/ Per Capita Income, these reflect earnings of individuals that are 15 years or older. This is the baseline for the US Census Bureau to calculate average income of any ethnic group, location, academic qualifications and other parameters. Another good way to find average income or average salary in America is from Bureau of Labor Statistics. BLS publishes a regular Economic News Release online that lists how much money an individual- female or male- from any ethnic group residing in US earns. Interestingly, Asian women and men have the largest average salary in US. The average income or median income of an Asian male aged 25 to 54 years is US$1,334. Asian women in the same age group earn approximately US$964 per week. White Americans and those of Latino or Hispanic origin rank second and third highest income earners respectively, according to a BLS report released in July 2018. European website Statista has some fascinating figures about the highest income on an hourly basis that Americans earn. Highest per hourly rate is US$12.50 in the District of Columbia. State of Washington ranks second with US$11.50 per hour. 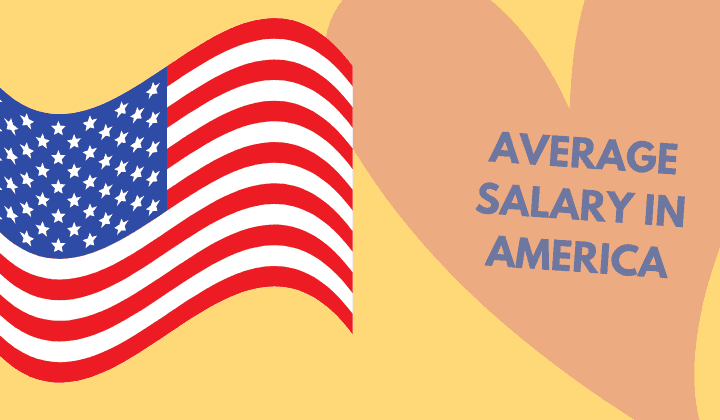 Massachusetts and California share the third position with the highest hourly salary of US$11. Other states where average US income on hourly basis is high include Arizona and Vermont at US$10.50 New York US$10.40 and Oregon with US$10.25. Statista report further states, the highest number of minimum wage earners in 2016 were high school graduates with no college education followed by women and men with Bachelor or higher degrees. In most states in US, Federal minimum wage stood at US$7.25 per hour. Shocking Details of Average Salary in US. The US Census Bureau in collaboration with the Bureau of Labor Statistics releases Current Population Survey frequently that lists various facts and figures about people in America. Among these is the Personal Income (PINC) supplement. The PINC-2 released by the Census Bureau and Bureau of Labor Statistics has some shocking figures about average wage in US. About 70.30% Americans have income less than US$50,000 per annum. Some 14% residents of USA earn between US$50,001 and US$75,000 annually. Nearly 6.5% of Americans have an income ranging between US$75,001 and US$100,000 per year. Just about 9.1%of America’s population has an income of US$100,000 or more every year. These figures translate as 90.8% of Americans having an annual income of less than US$100,000 per year. Some 40 million people in America were living below the poverty line, according to US Census Bureau reports. Whopping 84 percent of the poor were born in US while about 11 percent were illegal migrants to the country. Sadly, 56 percent of America’s poor were women of which 67 percent were white. Average annual income in America of a single person below the poverty line was pegged in 2017 at $12,572 per year for people less than 65 years of age. In the senior or above 65 years age category, the minimum average income was $11,750 annually for a person living alone. The poorest were said to be single parents. An adult living with a single child and having an annual income of $16,830 comes below the poverty line. Similarly, the average salary of $19,800 of a single parent living with two children is considered as below the poverty line. Average income in America in terms of educational qualifications is also highest among Asians. An Asian woman or man, aged between 25 years and 64 years holding a Doctorate earns an average salary of $91.430 per annum, states US Census Bureau. In stark contrast, a white female or male holding similar or equivalent academic qualifications has an average annual salary of $77,906. African-American lag slightly behind at $73,265 per year. Among the lowest US average incomes are Asian women and men aged 25 years and above that have completed only high school. They earn $22,380 per year. African-American women and men in the same age group fare slightly better: they make an average salary of $22,940 per annum. Global currency crises, political scenarios, US engagement in military conflicts abroad and various other factors also impact average American salary. While the average salary in US has shown slight increases over the year but remains stagnant when compared with inflation, freelancers in the country are having a field day. The average freelancer’s salary in US is about $22.84 per hour, according to Payscale. Of course, freelancers working in specialized fields earn much more. The US is home to the world’s largest freelance workforce: over 57.3 million women and men work as freelancers, a 2017 study conducted by Upwork found. The study notes, a majority of America’s workforce will consist of freelancers by 2027. This would mean higher average salaries in America for persons engaged in the gig economy. Additionally, work-from-home is also fast gaining ground in America as companies shun renting offices due to spiralling real estate costs. Crowdsourcing and hiring part-time employees are also on the rise since the system provides better flexibility to employers while workers earn more. Various debates over average income and minimum wages in America continue. Some states have introduced legislations upping minimum wage. Unfortunately, the system has boomeranged since people opt to work fewer hours. While average salaries in US continue to rise marginally, they may not have any significant bearing on American lifestyle. Despite Federal stipulations on minimum hourly wage, America continues to grapple with poverty. Another interesting factor of average income in USA is that eight states where households earn highest are located in the Northeastern part of the country. Maryland has the highest average household income in America while Mississippi has the lowest, reveal statistics released by the US Census Bureau. But how do you know that because you are ab Indian. But nice post sir there is no way to say about your knowledge.